For local tourist information, go to Age-of-Sail-Heritage-Centre on Facebook. The light is a timber "pepper pot " style building. Archival photos and records reveal that the lighthouse was built in 1907 and first lit with kerosene in 1908. For many years it presided over a flourishing harbour full of three masted schooners, busy tugs and log rafts. After the age of sail it stood sentinel to the building and launching of mine-sweepers during World War ll. and the peacetime building of scallop draggers until the late 1960's. A couple of those draggers are still working in the Digby fleet. One anecdote from the Coast Guard file, involved an emergency in the late 1930's when kerosene supplies ran out. The lightkeeper wrote a desperate plea for a barrel of kerosene to be sent on the next ship to Port Greville because the villagers were having to donate their private stock to keep the lighthouse lit each night! By the early 1980's, the light was no longer needed for navigation and it was discontinued. It might seem logical that the community would take over the maintenance of the local lighthouse. What isn't so logical or well known, is that the Port Greville Lighthouse was sawn in half in 1981, craned onto a huge flatbed truck and taken for re-installation at the Coast Guard College in Sydney where it "resided" until 1998. Lucky thing it was! Because it was maintained all those years and not destroyed like so many. 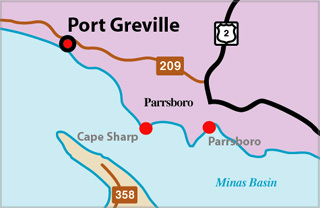 The idea to bring the Port Greville Light home bloomed in the spring of 1997 and led to research through the summer, greatly aided by Dan Conlin, President of the NSLPS. His information confirmed that the lighthouse at the College was, indeed, the Port Greville Light. Plans for a formal request to return it to the Age of Sail Heritage Centre got underway. A letter to Jim Wheelhouse, Director of the Coast Guard College, the first week of September pointed out not just to the practical considerations involved but to the deep cultural value of the lighthouse to the residents and summer visitors of the Port Greville area. 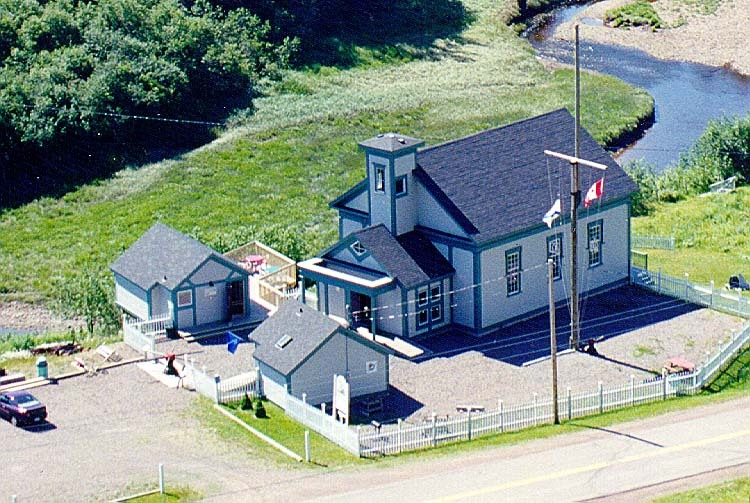 The enthusiastic development of the Age of Sail Heritage Centre over the past five years, stands as testament to the ability of supporters to carry through on their well formulated plans.Verbal agreement in October to the lighthouse coming home was followed by a Christmas letter confirming that the Coast Guard College was willing to gift the lighthouse to the museum. Now the real work began! January was spent identifying potential political and funding partners. Strong support for the initiative was secured from Bill Casey, M P, and Guy Brown, MLA. In addition, the Cumberland Regional Economic Development Association lend its expertise to the submission of proposals. The lighthouse was assessed for the most careful and effective removal from its base at the Coast Guard College. Jim Wheelhouse and John Falardeau at the College were very helpful in furthering the planning process. Safeguards necessary to ensure its safe travel by flatbed over Kelly's Mountain, Mt. Thom and Economy Mountain were established. No small feat! All the necessary materials and preparation were arranged for its installment at the Age of Sail Heritage Centre grounds. Its new home is perhaps not as traditional as its original one, 60 feet mid-bank on the shores of Greville Bay, but to the residents of Port Greville, it was wonderful to celebrate its homecoming and to see it enjoyed by residents and tourists alike. 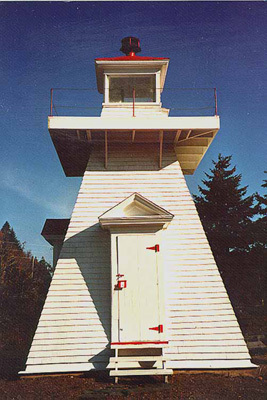 In June, 1998, the lighthouse was sawn in half again, loaded on a flatbed and trucked nearly the whole length of Nova Scotia, arriving to great fan fare in its home town. By July, it had been re-assembled, painted and was open to the public at the Age of Sail museum. The Port Greville Lighthouse is located at the Age of Sail Museum, Port Greville, several kilometers from it's original location on the cliff above the harbour. In 1981, it was cut in half and moved to the grounds of the Coast Guard College in Sydney Cape Breton. In 1998, the community brought it home! A great place to spend an afternoon! The restored lighthouse is open on the grounds of the Age of Sail Heritage Centre overlooking the Greville River. The museum, includes displays and video about the lighthouse, and highlights ship building and the days of sail in the Minas Basin, with thematic displays, models, artifacts, and a genealogy database. There is a blacksmith shop, an old slip site, and a tea room/gift shop. Light Height: 059ft feet above water level.